2 Bananas: has a 'race to the top' begun? 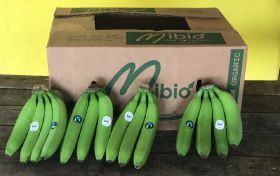 Allfresch’s new Mibio premium organic banana range reached UK shores for the first time last week after arriving from the Dominican Republic. According to the UK-based suppliers, the new product has shown promise with positive feedback and interest from various retailers across Europe, and is being offered primarily to customers in the UK and France. Mibio provides customers with an alternate source of organic bananas, and the fruit is typically available packed in 18kg cluster bags or loose in 18kg cartons. Dale Lloyd, organics supply manager, said the company has developed a stronger supply chain to ensure their organic bananas arrive at their peak. “Alongside our producers, we have developed a premium supply programme with improved production and tighter quality controls, ensuring that each banana complies with the highest quality standards so that our customers receive only the freshest, organic and environmentally friendly products,” Lloyd said. In addition to improved quality standards, the groups integrated supply chain also provides their customers with a direct contact at the source. Each customer benefits from direct access to the Supply Chain Manager, whom they can speak directly with about volume planning, logistics and general queries, according to Allfresch.